Hideki Nagaishi: The characters in Berserk Golden Age Arc and Harmony were created with toon-shaded 3D CGI. Could you please let us know the history of introducing computer graphics into the animation production at STUDIO 4°C, in brief? Eiko Tanaka: At first, we rendered a rose flower in Magnetic Rose*3 as 3DCGI by using Apple’s Macintosh Quadra, which we now call “the ancestor”. The software we used was Strata Studio Pro. We could have the ability move the camera freely without using a physical camera stand by utilizing computer graphic technology from the production of Noiseman Sound Insect (1997). In addition, we have used toon-shaded 3DCGI rendered by a software named 3ds Max to animate tiny or complicated things such as mobs*4. Berserk Golden Age Arc is the first film where STUDIO 4°C drew the main characters using 3DCGI. 3DCGI was the only way for us to draw and animate all the details of a lot of soldiers with complicated armor in the film, with precision. We didn’t have enough 3D animators in the production team in the beginning of the film project, so we started from bringing up 3D animators by internal training. We introduced a software named Maya from Berserk Golden Age Arc. We are still using 3ds Max, but we are gradually shifting to 2D-like animation using Maya. *3: A short film directed by Koji Morimoto, which is one of the short films in MEMORIES (1995). *4: Mob: A specific word in Japanese animation industry, meaning background or extra characters in animation. Hideki Nagaishi: How do you think will STUDIO 4°C use both traditional hand-drawn 2D animation and toon-shaded 3DCGI? Eiko Tanaka: 3DCGI is one of the ways of expressing characters in animation, so we would like to use it as one of the tools. Hand-drawn 2D animation and 3DCGI are both still character animation. There is a unique method to make 2D-like animation by using 3DCGI in Japan. STUDIO 4°C is striving to create a sharp and comfortable 3D animation style, which is different from the way of expressing movement in foreign animation, by expanding the unique method that Japan has. On the other hand, I feel that 3DCGI has a new power of visual expression, which traditional 2D animation doesn’t have. So, I think we have to make use of them for developing new ways of visual expressions as we use 3DCGI. What we are pursuing is the visual quality of completed animation, so there is no problem whether we make it by traditional 2D animation production or by using 3DCGI production, as long as we obtain a satisfactory final moving image. I’m personally anticipating that 3DCGI will further contribute to our animation production in the future because 3DCGI technology and its creators are progressing significantly and quickly. Hideki Nagaishi: Disney has a story on when they developed Tangled (2010), 3DCGI creators learned the expressive properties of traditional 2D animation from Glen Keane, and they took a long time inventing a technology and method to reproduce those methods by 3DCGI. As same as Disney at that time, there are many really talented 2D animators in STUDIO 4°C, right? Eiko Tanaka: 3DCGI in STUDIO 4°C is developing 3DCGI production together with 2D animators as well. We started from experienced 2D animators teaching 3DCGI animators about keyframe animation, which is the mainstream method in Japan at the moment, by using rough keyframes and animatics they made. Then, the 3DCGI animators grew rapidly and were able to express Japanese limited animation-style movement by themselves after a while. Thus, we built the know-how of 3DCGI production through Berserk Golden Age Arc and made good use of them when we made Harmony. Hideki Nagaishi: How does STUDIO 4°C decide the animation titles to develop, and what criteria does the studio have for the selection of titles? Eiko Tanaka: In terms of finding stories to animate, either I find it myself by keeping open to new information, or I’m told good stories from staff at internal planning meetings. Thinking back, it seems like I have picked up stories with characters living with a positive mindset. We only start each project if STUDIO 4°C can find a theme with a strong message in the story, that can be conveyed clearly through animation, and only then do we start the project officially. So, sometimes we give up a project if we cannot find any important message in the story at the beginning of the project. If there are staff and creators who are seriously motivated to create the animation, and we think the original story has the power to provoke the desire to animate the story and bring it out, we will then commit to making a skilled team for the project, and they will complete it without any resignation and compromise. That’s the STUDIO 4°C way. Hideki Nagaishi: Regarding to the core message of each title you mentioned, is it shared among all the team members at the beginning of the project? Eiko Tanaka: The core message of each title is generally vague at the beginning of the project. There is definitely a big important message in the story, but we will find many different messages in a story or parts of the main important message are scattered around the story. So we, the core members in the team of the project, keep discussing about those messages, as in: “That is a message, this is also a message, it is also important”, and spin them into a larger message, which will be the core of the animation. After that, we share the message among all the staff of the project by explaining that “It is this kind of story, so these things are important”, in order to raise the quality of the visual expression in every corner of the animation. Hideki Nagaishi: I see, you have made certain the core of the story in all your projects, and that is why STUDIO 4°C’s titles have a clear story, even though they contain a lot of information. Eiko Tanaka: There are some cases, such as uncovering a core of a story through brainstorming at every meeting after building the production team, or just the director and I think of the core of the story over and over, and make it clear. If the project is based on an original story and the story has an well-structured and good plot, which fascinates its audiences, and can’t be compromised when we animate, our direction would be based on that story. I’ll give you a concrete example of that. In the beginning of the film project Tekkonkinkreet, Michael Arias had a vision of the film: “The Japanese Yakuza are cool, and characters like Mr. Suzuki, a Yakuza in the original Manga story, will be globally accepted.” On the other hand, I was thinking that a characteristic of the film could be the message that societies must not abandon the weak, and it should be liberal and tolerant of the weak. I also wanted to make the film enjoyable for young couples, to make many more people go to the cinemas to watch it. There are two main characters, Shiro and Kuro, in the original story of Tekkonkinkreet, and Kuro abandoned Shiro because he became uncertain about how to take care of Shiro through his coming-of-age, because Shiro is slow-minded and became an encumbrance to him. Abandoning Shiro, a pure-at-heart person, removed Kuro’s inhibition to his violent part of him, and makes him a dangerous person and becomes mentally ill by hurting his mind. I thought that there is a message here in that part of the story: “It is not until there is a society, which is liberal in and tolerant of the weak, that humans can enrich their heart and get spiritual happiness.” So, I shared that opinion with all the staff, and got their agreement. Then I completed the proposal of the film project. 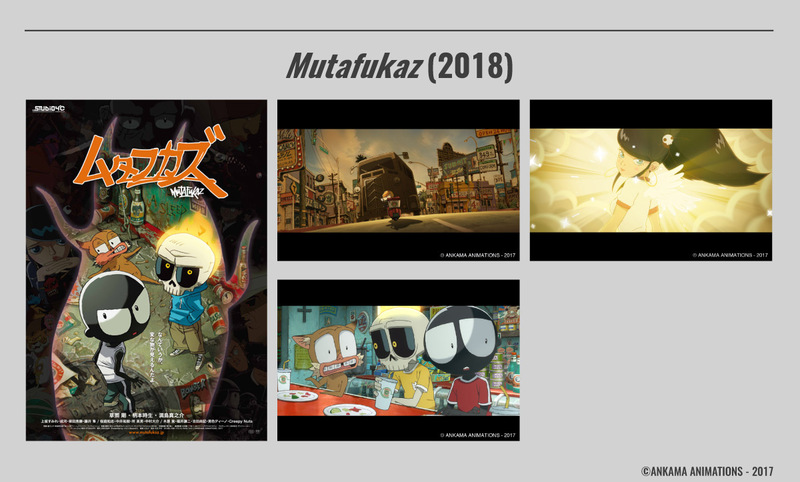 When we made Mutafukaz (2017) with Ankama Animation, a French studio, I thought that even though the original story has many intense violent scenes, it was not the theme of the story. I found a strong message in a part of the story where a character named Vinz remains best friends with the main character Angelino, despite knowing that Angelino is an alien. So, I persuaded Guillaume Renard, the author of the original comic series and the co-director of the film, to make the film as a buddy story: “Once you are friends with someone, you cannot abandon the friendship. You can survive through anything that happens, if we stay friends”. He was happy to agree with my idea, so we re-wrote the scenario as that direction, and started the production. Regarding to a girl character named Luna in Mutafukaz, the Japanese co-director Shojiro Nishimi thought, “I want to show through Luna that a girl can be someone who can raise a boy’s motivation”, so we expressed the inside of her emotions, which showed the relationship between her and Angelino, which were not depicted in the original comics. The story and direction of the film are a bit different from the original comics. I think that finding that kind of core message in a story is the first hard task for a producer in a project, and sharing that message with all the members of the team is crucial in making a good animation.